La Tomatina is a tomato throwing festival that takes place in the town of Bunol in Spain. ‘Food fight!’ brings back a lot of memories from childhood. Now, imagine that on a bigger scale – a city wide scale. Welcome to La Tomatina. 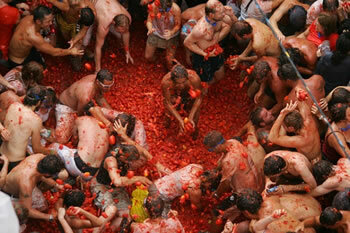 La Tomatina is a festival that revolves around throwing tomatoes at one another for the spirit of good fun. La Tomatina takes place in the Valencian town of Buñol, near East of Spain. The festival has been happening since 1945. The history of this festival is just as fun as the festival itself. The festival can be dated back to the last Wednesday of August 1945, when a few young people to the town square to attend the Giants and Big-Head figures parade. They decided to join parade as a musician and in all the excitement, they caused a person to fall over from the float. The participant who fell from the float went into a fit of rage and started throwing things at random people and passerby. Within reach was a vegetable stall that resulted in a lot of people throwing tomatoes at each other before the police came by and broke up the fight. The following year, a few young people decided to pick a fight on their own and bring their own tomatoes from home. This also ended with the police coming to disperse the fight. Without knowing, the young boys sent forth a tradition. La Tomatina was banned in the 50s, but the ban did not stop the people from continuing with the tradition even if they were arrested. Each year the festival got more and more participants. From 1975, the festival is staged and organized by the people of "Los Clavarios de San Luis Bertrán". In 1980, the town council took over the responsibility of organizing the festival. Today, the festival requires tickets for entry in order to limit the number of participants for safety reasons. The festival is also no longer limited to that little town in Spain; many countries around the world hold their own Tomatinas – although not in such as large capacity as the original one.